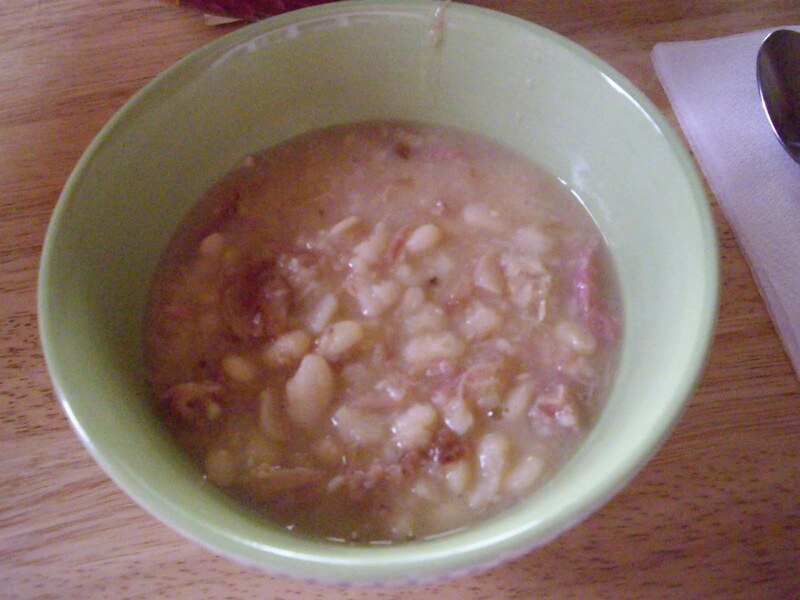 Ham and bean soup is a marvelous comfort food. It’s simple and tasty, like most comfort foods. I always buy the bone-in hams and use the leftover bone and broth for cooking my beans in. But, use the boneless ham if you prefer. You will need a 4-5 quart Dutch oven with a lid. Rinse and soak your beans for at least an hour before cooking. You don’t need to soak if you don’t want, but you do need to rinse them off. The soaking just speeds up the cooking a little bit, about 15 minutes or so. Put the ham bone or ham in the pan. Add the broth if you have it. Turn on the heat to medium high and bring the beans to a boil. Turn down heat to medium low and put lid on so it sits slightly off. You want some steam to be able to escape. Keep the beans to just a simmer. You do not want a rolling boil. Stir every once in a while. Cook for about an hour and remove the bone, if you are using. Remove any ham and return it to pan of beans. Cook for another 1/2 hour or until beans are done. To see if it is done, remove a bean from the pan and blow on it. If it is done, the skin will blister and peel away from the inside. If you bite into it, there will be no chalkiness. If you want a slight creaminess to the finished beans, with a potato masher or slotted spoon, mash up some of the beans in the pot. Stir. Serve with homemade white bread or corn bread.